Whether you look out over the golf course, towards the scenic mountains or simply into your secluded backyard, glass doors and windows open your living space to the wonders outside. Theres nothing like an all glass shower. With over 30 years of doing quality business in the Coachella Valley! We are a family-run business located in Palm Desert that deals with all things glass and mirror. 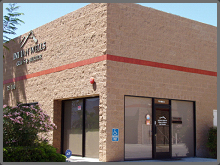 We provide custom and residential services to all areas of the Coachella Valley. Doc and Adam Seuss are a father and son duo who joined as business partners and co-owners of Indian Wells Glass and Mirror. Doc has been in the glazing business for over 30 years and is still going strong. Stop in and take a look at our showroom, or call us to schedule a free in-home estimate! We are a family-run business located in Palm Desert that deals with all things glass and mirror. We provide custom and residential services to all areas of the Coachella Valley. Whether you have an interest in a new shower enclosure, sliding glass doors, updated windows, skylights, or wardrobe doors, we can provide the services that you need. Our mission is to provide clients with the best available customer service, in the most cost effective way that we can. We want to show customers that we truly care about their needs and are always willing to going the extra mile. Our focus is on our clients and their satisfaction. We have a team of highly trained, responsible individuals committed to making our company rise above the competition. We stay on top of the glazing industry by expanding our knowledge and learning in the field. We value hard work, responsibility, honesty, and we have respect for the individual. No project is too big or too small. We take pride in every project, no matter the size. We are committed to excellence and prove it on a daily basis through our quality services.